Regular price $122. Combo price. $99 • CKSS Save $23! 8 Free canisters and Free storage box included with purchase of class sets of 8! Create an attitude of gratitude in your classroom. 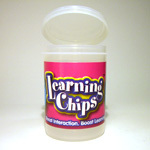 Students use this chip set to drop appreciations on teammates and classmates. Appreciations include simple feel-good phrases such as: "You are awesome!," and sentence starters for students to create specific praisers such as, "Thanks a million for…." 8 sets CMDA • $29 Save $11! Praising words and actions for teams to celebrate or to congratulate a teammate. 8 sets CMDC • $29 Save $11!